Chester knows what his purpose is: find his person, and be that person’s service dog. But when fear of loud noises derails his certification, he’s at sea . 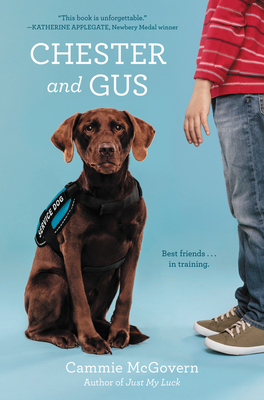 . . until Gus’s parents choose him to be a companion to their son, who has autism. It’s not what Chester had in mind, especially because Gus seems completely uninterested in him. A relationship slowly develops as boy and dog begin to communicate wordlessly. Love dogs? Fascinated by how kids who aren’t neurotypical navigate the world? Just want a great story movingly told? This book’s for you.